Should the Sounders Play a 3-5-2? Everyone recovered from that thriller on Saturday night yet? That’s okay, me neither. Seattle’s brilliant comeback against the Vancouver Whitecaps may have seemed frenzied and disorganized in the moment, but was actually the result of a key tactical switch. With the Sounders trailing 2-1 in the 61st minute, Sigi Schmid subbed on Marc Burch for an ineffective Alex Caskey. Burch, a defender by trade, was deployed higher up the pitch on the left flank, providing much-needed width that completely changed the attack. The sub moved the Sounders into a 3-5-2 formation and freed Mauro Rosales. 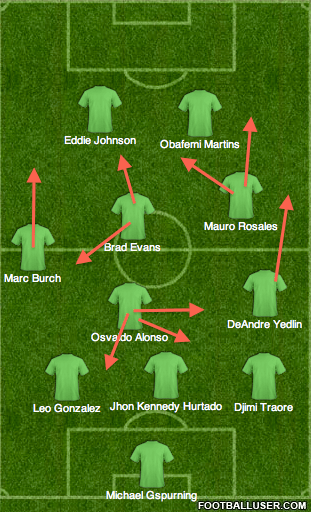 With Burch and DeAndre Yedlin playing as wingbacks, Rosales was able to drift around and find space to create. The setup was largely responsible for Seattle’s third goal, Lamar Neagle’s eventual winner. Here’s the early build up to the goal. Burch is hugging the touchline on the left. Leo Gonzalez has ventured far forward while Obafemi Martins waits on the shoulder of the last defender. Notice how Rosales has drifted extremely far inside and is drawing four Whitecaps defenders. Rosales plays the ball back to Servando Carrasco who then sends it to Andy Rose in a pocket of space. Several things to notice here: Rosales’ presence in the middle drew four defenders and left the ‘Caps out of position. This leaves a three on three for the Sounders in addition to space on the right side. As soon as Carrasco plays the ball to Rose, DeAndre Yedlin starts a run down the right flank into that space to create an overload. Rose turns and dribbles into the space. Vancouver left-back Greg Klazura holds his position because of Yedlin’s wide presence, which creates a gap (yellow oval) between Klazura and Johnny Leveron. Rose plays a splitting through-ball into this area for Obafemi Martins, who lets it run by before chasing it down and crossing for Lamar Neagle to slot home. This goal is a great argument for the Sounders playing a 3-5-2 because it shows how Yedlin’s (and to some extent Burch’s) wide play can be a key factor in creating space and goals. A 3-5-2 also isn’t the most defensively sound formation (just ask recently-relegated Wigan Athletic), suggesting it’s best used for home matches where Sounders expect to dominate possession. Finally, Schmid may not have the personnel to play a 3-5-2 for the next few matches. DeAndre Yedlin, who’s skillset most benefits from the formation, is off to the U20 World Cup and could be gone until July 13. Brad Evans could be a nice fit at right wingback when he returns from National Team duty, but when Eddie Johnson also returns and partners with Martins, Schmid would be better served playing a 4-4-2 with Neagle wide. In short, the 3-5-2 is a good option when the Sounders want to throw out a different look or when they’re chasing a game, like on Saturday or against Tigres in the CONCACAF Champions League earlier this year. In the end though, the wing talent and on the roster and Yedlin’s absence probably means we won’t see a 3-5-2 with any regularity. Sports with Neil and Friends Should the Sounders Play a 3-5-2?